The FORMA Design studio was in charge of using the solid surface from PORCELANOSA Group, KRION, to design the Capital Aesthetic + Laser Center project. 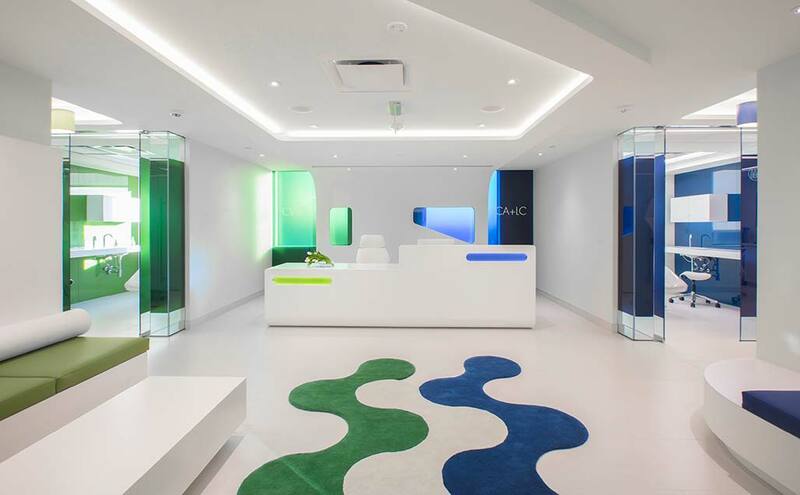 It has an unusual and ingenious layout, which divides the reception area, making a more effective use of the premises, and using colours to differentiate both spaces and brands. Since it began in 1994, the FORMA Design studio has been awarded with a multitude of distinctions, winning the award granted by the American Institute of Architects 12 times, and winning the award granted by the International Interior Design Association on 18 occasions, among other important recognitions. We can find KRION transformed in the reception, washbasins and countertops of the rooms in the KRION 1100 Snow White colour, selected for Capital Aesthetic + Laser Center, Washington D.C., USA, due to its aseptic character and its multitude of properties which make it ideal for the healthcare sector. Capital Aesthetic + Laser Center is a multifunctional space in which we find a plastic surgery clinic specialised in botox, fillers, and liposuction, among other aesthetic procedures, and the comprehensive clinic for injuries, specialised in the elderly who have experienced major trauma.